Katherine asked me to put a post up for her tonight. Amelia has been admitted into the ICU with confirmed RSV. She's dehydrated. After about 11 or more tries (in her hands, feet, arms, and scalp), they finally gave up on putting in an IV and are just trying to feed her by mouth every 30 minutes. As of a couple of hours ago, her oxygen sats were 88 and her heart rate was 217, but improving. Before admittance to the hospital, her fever was 103.5 but with Tylenol every four hours at the hospital, she's held at 101.5. Please keep Amelia in your prayers. Katherine is posting updates on Twitter. You can keep up with her tweets on the side of the blog if you aren't on Twitter. Oh goodness, I hate to hear she is so sick. Praying for both baby & momma. Thanks for letting us know. Praying so hard for little Amelia. Hope she has a quick recuperation and you get some rest too. Will be thinking of you. Oh, sweet girl :( Thanks for the update, Patrice. Lots of prayers, I hope she improves quickly. Thanks for all your updates. We're praying for her hard. So glad you guys are able to be with her. hang in there. My little man (now 5) had RSV when he was 5 months old...1 week in the hospital, then home, then bounce back to hospital with pneumonia for 10 days. he is now a healthy, thriving 5 year old boy! She will be fine! Sending prayers for rapid recovery! Oh no!! I hope she is feeling better soon. She looks mighty cute! 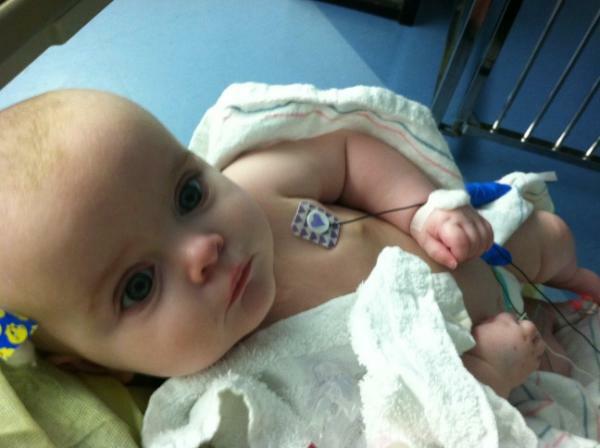 My daughter was hospitalized with RSV for a few days when she was about Amelia's age. Definitely a scarey time, but we also felt blessed to have access to healthcare that could help her feel better. Lots of prayers coming your way! I'm so, so sorry!! I'm praying for all of you!! We just got out of the hospital yesterday with our 9 month old from RSV and hand, foot and mouth. Prayers being lifted up for Amelia! Oh dear! I must have missed this post yesterday. I hope everything is improving for Amelia.